— Ernie Pyle, a roving reporter in Kansas, just north of the Oklahoma border, June, 1936. 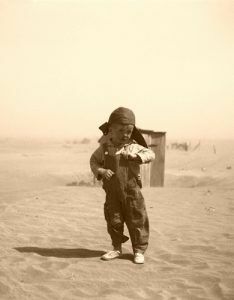 The Dust Bowl of the 1930s, sometimes referred to as the “Dirty Thirties”, lasted about a decade. 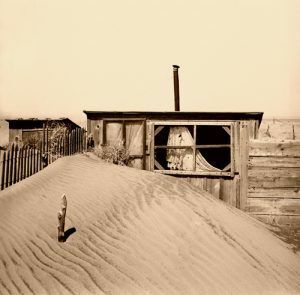 This was a period of severe dust storms which caused major agricultural damage to American and Canadian prairie lands, primarily from 1930 to 1936, but in some areas, until 1940. It was caused by severe drought and decades of extensive farming without crop rotation. The main area of impact was on the southern plains, though northern areas were also affected, but not nearly with as much devastation. The drought hit first in the eastern part of the country in 1930 and by the next year, it began to move westward. 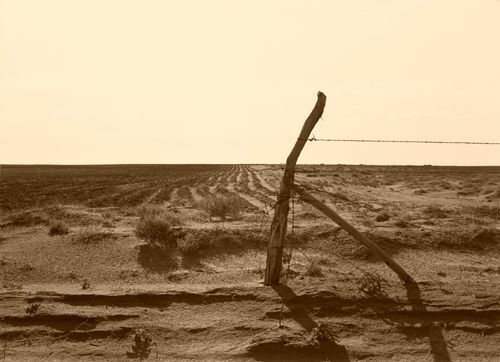 By 1934, it had turned the Great Plains into a desert and helped to lengthen the Great Depression. For decades, unknowingly, farmers had not utilized the concepts of fallow fields and crop rotation, cover crops to manage soil fertility and quality, or other techniques to prevent erosion. The deep plowing of the topsoil had killed the natural vegetation that normally kept the soil in place and trapped moisture even during dry periods and high winds. Wheat crops, in high demand during World War I, further exhausted the topsoil and overgrazing stripped the western plains of virtually all other cover. As a result, during the drought of the 1930s, the soil dried and turned to dust, soon blowing in large dark clouds. Given names like “Black Blizzards” and “Black Rollers,” these rolling clouds often reduced visibility to a few feet. The region most affected – the Great Plains, included more than 100 million acres, centered in Oklahoma, the Texas Panhandle, Kansas, and parts of Colorado and New Mexico. These millions of acres of farmland became useless and soon, hundreds of thousands of people were forced to leave their homes. On May 11, 1934, a severe dust storm blew over 340 million tons of dust all the way to the East Coast. The New York Times reported dust “lodged itself in the eyes and throats of weeping and coughing New Yorkers”. Dust flew as far as Boston and Atlanta, and even ships within a few hundred miles. Another massive dust storm, dubbed “Black Sunday” struck the nation on April 14, 1935. Famed American singer-songwriter Woody Guthrie was living in Pampa, Texas at the time, and when the storm rolled in, many in the Texas Panhandle thought it was the end of the world. It inspired Guthrie to write the iconic song “So Long, It’s Been Good to Know Yuh“, considered one of Guthrie’s best and now included in the Library of Congress. The term stuck, spreading across the airwaves and newspapers, though the people of the region hated the negative term, which they knew played a part in diminishing property values and business prospects in the region. Soon hundreds of thousands of people began to abandon their land when the dust storms showed no signs of letting up. Others were forced out when their land was taken in bank foreclosures. In all, more than 500,000 people, primarily from Texas and Oklahoma, were left homeless. One-quarter of the population left the affected area, packing up everything they owned and heading westward, where they hoped to find greater opportunities. The Dust Bowl exodus was the largest migration in American history within a short period of time. 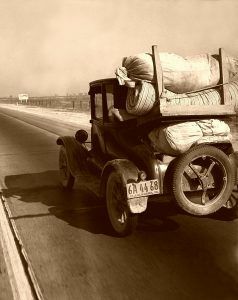 By 1940, 2.5 million people had moved out of the Plains states, headed primarily for the west coast. 200,000 of them moved to California. Though these families left farms in Oklahoma, Arkansas, Missouri, Iowa, Nebraska, Kansas, Texas, Colorado, and New Mexico, all were generally referred to as “Okies,” since so many came from Oklahoma. Unfortunately, many of those that traveled to California, found economic conditions not much better and were not received warmly. In fact, in 1936, when they reached the border, they found border patrols posted there to keep them out. Of those who made it in, they owned no land and were forced to work, if they could find a job, mostly on large corporate farms, whose crops of fruit, nuts, and vegetables were unfamiliar. Paid starvation wages, they were often required to pay as much as 25% of their wages to rent a tar-paper shack with no floor, electricity or plumbing, and buy their groceries from a high-priced company store. Many emigrants gave up farming, setting up shacks and tents near large cities, hoping to find a job. Their homes, built from scavenged scraps, had no plumbing and electricity and polluted water, lack of trash and waste facilities often led to outbreaks of typhoid, malaria, smallpox, and tuberculosis. Farming camps, filled with poverty-stricken migrants, dotted the countryside. But the native Californians who didn’t like it pressured lawmen to break them up. When this didn’t work, vigilantes sometimes formed, beating the migrants and burning their shacks to the ground. In 1933, President Franklin D. Roosevelt established governmental programs designed to conserve soil on the Great Plains. Additionally, the Federal Surplus Relief Corporation (FSRC) was created to stabilize pricing of agricultural commodities and distribute food to families nationwide. After “Black Sunday” in 1935 created more national pressure, the government formed a Drought Relief Service (DRS) to coordinate relief activities and began enforcement of new regulations on the farm industry. Roosevelt also ordered the Civilian Conservation Corps to plant a huge belt of more than 200 million trees from Canada to Abilene, Texas to break the wind, hold water in the soil, and hold the soil itself in place. By 1937, education programs were in place to teach farmers about soil conservation and by the following year, the conservation effort had reduced the amount of blowing soil by 65 percent. However, it would be two more years, before the drought was over, and farmers could once again grow crops on the land. One of the best literary descriptions of the time was John Steinbeck’s novel, The Grapes of Wrath published in 1939. Awarded both the Nobel Prize for literature and the Pulitzer Prize, the novel focuses on a poor family of sharecroppers who travel from Oklahoma to California, during the Dustbowl Days of the 1930s, trying to find a better existence for themselves.